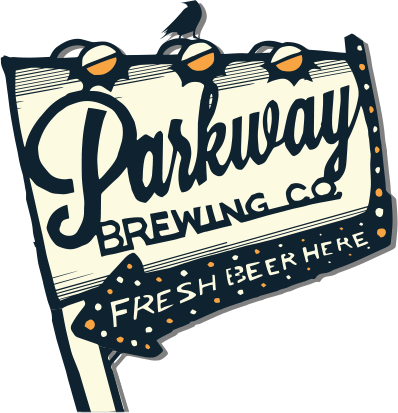 The story of Parkway Brewing Company is a love story, a story that embodies the American Dream, a story of do-it-yourself determination, a story that continues on an exciting journey- much like the scenic highway for which Parkway Brewing is named. Two couples with a dream: a Master Brewer with a scientist’s brain and an artist’s palate, a visionary instigator with a dogged determination and their two creative and clever wives saw craft beer culture exploding across the nation and wanted to bring it home to the mountains of SW Virginia. Since opening in 2013 on Kessler Mill Road in tiny Salem, Virginia, Parkway Brewing Company has not only created some of the state’s tastiest brews, but they have created a place that has brought together a community of like-minded, free-spirited beer lovers with a penchant for the great outdoors. Their original and distinctive branding has cemented their place on the map amidst a sea of new breweries.